On this page, find innovative tools that can be used to teach content in your class. For example, find information, suggestions, and tips for how to teach students about a topic with the use of visualizations or Google Earth. Teaching with Visualizations - Many students identify themselves as being visual learners. Using graphs, maps, and animations helps students to understand concepts. Of particular interest are the phases of the moon animations and global warming graphs. 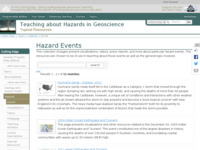 Hazard Events - Provides a collection of visualizations for a number of recent hazard events that have captured the public's attention. These events provide teachable moments in classrooms and help students understand the relevance of what they are learning. Each event page has information that describes the scientific concepts behind the event and includes visualizations to help students understand the phenomenon. Using Direct Measurement Videos to Teach Physics Direct Measurement Videos show situations that students can use to learn and apply physics concepts. Grids, rulers, and frame-counters are added as overlays on the video allowing students to make precise measurements of quantities such as position and time, without needing additional video analysis software. A Civil Action - The Woburn Toxic Trial- This landmark case is presented through the award-winning book A Civil Action and the movie of the same name. This project includes several different modules to teach the case including science experiments and a mock trial. Teaching with Google Earth- This resource offers information about how to incorporate Google Earth into your class. The resource presents a collection of materials that use Google Earth along with specific examples of how you might use Google Earth in your class. Teaching with GIS - This resource provides descriptions of work that can be accomplished through the use of analysis of printed and electronic maps to teach about GIS concepts without requiring students to use software that is not accessible to most high school students. 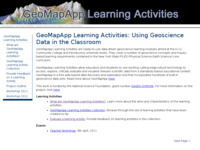 GeoMapApp activities provide a way for educators to use geoscience data and imagery in the classroom. The site contains data-driven geoscience learning modules aimed at the K-12, Community College and Introductory university levels. 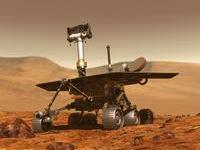 Mars for Earthlings seeks to expose undergraduate students to planetary study through Mars remote sensing data and Earth-based analogs. Two resources exist to help science educators incorporate math into their curricula to build number sense and math confidence in students. The Math You Need, When You Need It resource addresses incorporating math into introductory Geoscience classes and can apply to high school level science courses. The National Numeracy Network offers ideas and lessons to help students think quantitatively.